In the last blog I wen t through a clean install of 11.1.2.2 and covered the key changes in this latest release, today I am going to go through an overview of applying the maintenance release from 11.1.2.1 to 11.1.2.2. Last year I covered the maintenance release from 11.1.2.0 to 11.1.2.1 and to be honest the process is pretty the same so I don’t really want to repeat too much and concentrate on differences and any issues that may arise. I have tested applying the maintenance release to a couple of windows environments which I know is not a true reflection on whether issues are going to be experienced or not but this is only intended to give an idea on the possible process to follow.. 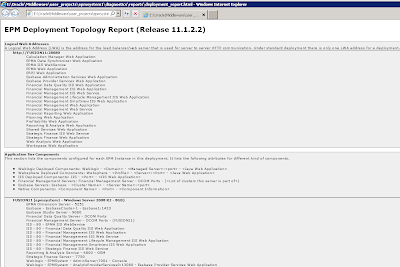 The only difference between the environments was one of them started its life as 11.1.2.0 and then went to 11.1.2.1 and now 11.1.2.2 and the other started off as 11.1.2.1, both using Oracle as the repository. Please do note this is only an overview and the documentation should be studied as it does contain vital information. Business Rules no longer exist and you must migrate to Calculation Manager, I will cover this in more detail shortly. Planning/HFM both use a new ADF interface (it is possible to use existing) which bring their own challenges. o Increased resource requirements – Can your current infrastructure cope. I do suggest having a trial of the new ADF interfaces as they are quite a big step change which will impact the users, it also worth regression testing for possible issues/bugs and judging the performance as there may be some noticeable differences from previous versions. There are a number of prerequisites before applying the maintenance for the full detailed rundown head over to the documentation. 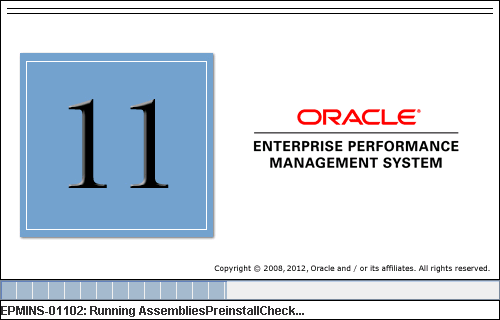 You must apply the maintenance release to all EPM System products in the deployment. You cannot apply the maintenance release to only some products. All EPM services must be stopped. If you have any of the clients installed in the environment these must be removed as the clients are now standalone and the installer will not upgrade them. 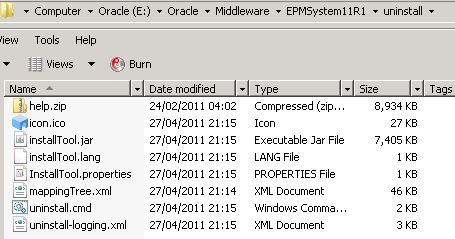 If linked objects (LROs) in essbase are being used they must be exported and deleted first. If you are using Business rules you must migrate to Calculation Manager. There are few options available and the documentation seems to differ between the configuration and the Calculation Manager documentation. 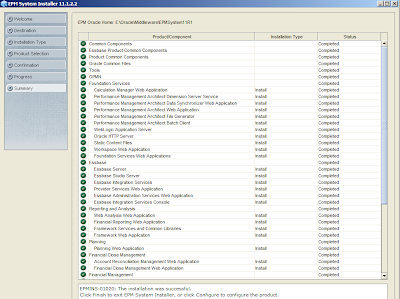 If using Web Services manager with PCM then MDS schema will need upgrading. If you are using Financial Close then there are quite a few prerequisites so go through the documentation. 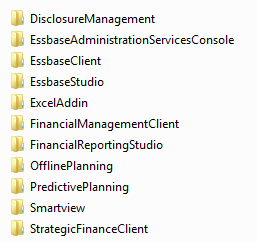 So to just cover some of the above topics, if there any clients installed on the environment you are upgrading then this will need to be uninstalled on each machine. 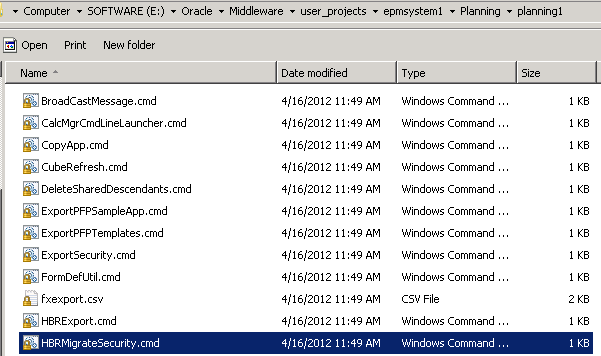 Above is a list of the standalone clients that are available as MSI installers and combined into one download. 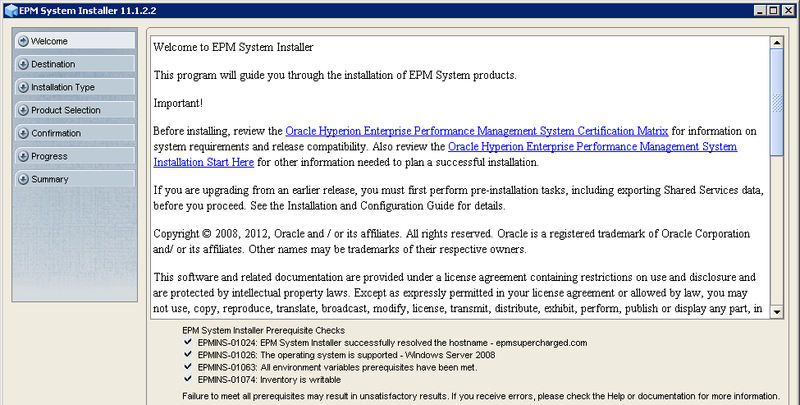 You don’t need to uninstall the EPMA and FDM clients as they still delivered as part of the installer. If you are applying the maintenance release to 11.1.2.0 and have FR Studio installed then that will be in the list and should be selected. The uninstaller will need to be run on each machine where clients are hosted. The Financial Reporting Print Server is no more in 11.1.2.2 and has been merged into the web application so it can be removed. Run FRRemovePrintServer.cmd from the location where the FR Studio was installed. This should remove the windows service and the HR printers. If you are upgrading from 11.1.2.0 then follow the process here. If you are using Ghostscript or equivalent then this can also be uninstalled as it is no longer required. Making sure that “For Calc Mgr” is selected, and then import them into Calculation Manager before applying the maintenance release, at least this way you know that the rules are definitely going to be available in Calc Manager. If there is an associated outline remove it. 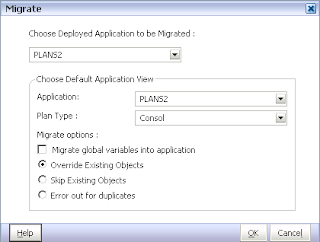 A location should be applied to each application you want the rule to be applied to, a rule cannot be applied to multiple plan types in the same application to be able to migrate to Calculation Manager. Once again "All locations" is not valid for Access Privileges. Access permissions should be applied to each location. That is the way the document reads to me but if you then look at the Calculation Manager documentation it has a table which defines the possible outcomes depending on how your rules are defined. I also tested leaving the “All Locations” on the rules and it is possible to import them into Calc Manager 11.1.2.2. So it is definitely worth having a study of the table and then decide what works best for you and there is also much more detailed information around migrating business rules available here. I covered the differences in the file structure in the last blog. Log in with the same user that performed the original install and start the installer using installTool.cmd/sh and a number of pre-installation checks will be made, if there are any issues an error panel will be displayed. The same prerequisite checks are made as if it was a clean install and as this is a maintenance release you would hope that all the checks will pass. Depending on the products installed on the machine then it may be possible the PATH environment variable check will fail, in this case you would need to check the variable and see if you can remove any of the references. The host name check may also fail as it has resolved to an IP address, this is more than likely to happen if it is a personal install or network/dns issues and can be fixed by updating the host file with the IP and hostname. The Middleware Home will have been previously defined so it cannot be changed. The “Apply maintenance release” should be the only option available. All the product components that the maintenance will be applied to will be automatically selected, you will notice that the majority of clients are no longer available. 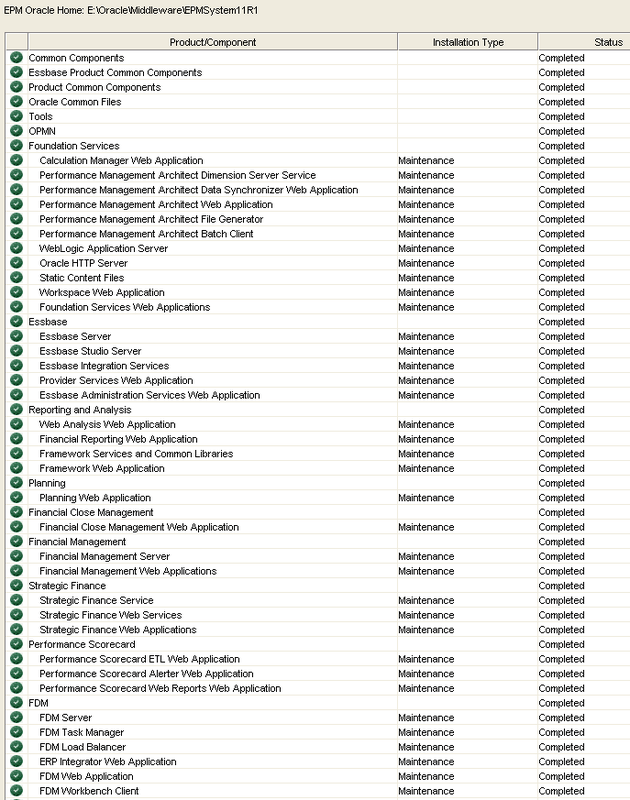 If the maintenance has run smooth then all the components should be marked with a green tick. I did experience an issue OPMN on one of the machines I applied the release to but to be honest the machine has been put through its paces and it could a number of reasons why it failed. I did find a workaround and if anybody else does get an OPMN failure with the log stating “java.lang.UnsatisfiedLinkError” then I will post a possible solution. 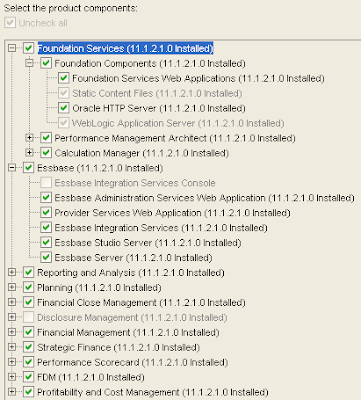 If you are installing in a distributed environment you should then you should repeat the same steps on each machine. 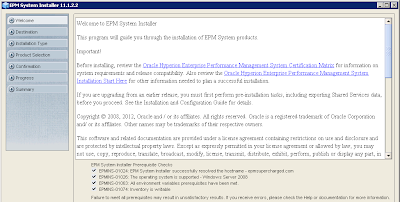 The option to modify/create an EPM Oracle instance has been removed in this version and as it is a maintenance release you shouldn’t need to modify anything. All the options are selected that need to be configured, this is all well and good but it assumes that the configuration is done using one database, if the EPM environment has been configured with one database/schema then it is possible to just carry on but if it has been configured for one database/schema per product then you will need to then run through in stages. Connect to a previous configured Shared Services database should be selected. Deploy to existing domain should be kept. 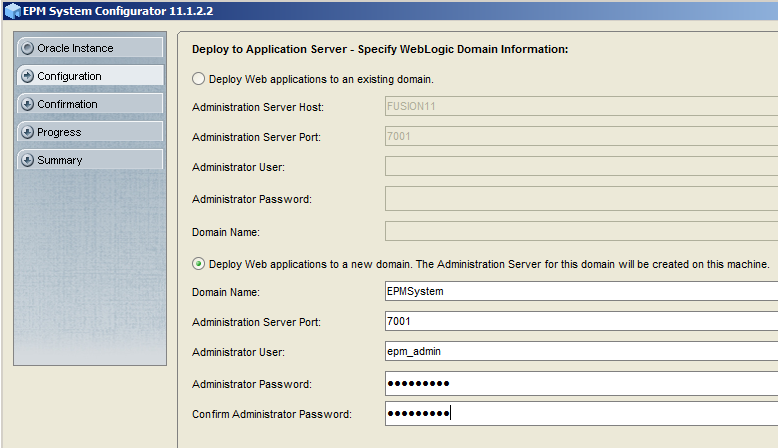 In this release there is the option to deploy the web apps to a single managed server (compact deployment). If you want to start using this feature then you will need to deploy all the web apps to their own managed server first before the option can be selected. 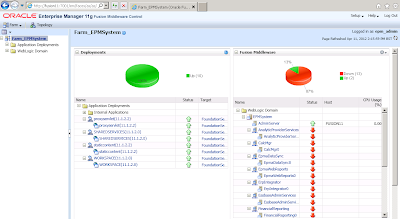 If you are using HFM there you will notice an extra web application deployment which is for the new ADF interface and is combined with the Web Services. 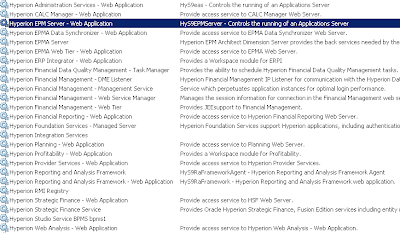 This deployment will generate a new windows service name of “HyS9EPMAWebTier” and a display name “Hyperion EPMA Web Tier - Web Application”, so if you have a batch script that starts up the HFM services you will need to update it from the previous name of “HyS9FinancialManagementWebSvcs” – “Hyperion Financial Management- Web Services” to the new name. 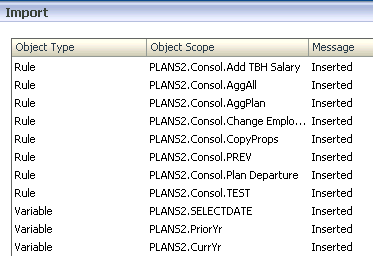 When configuring the databases make sure that connect to a previously configured database is selected and double check that the correct schema/db has been selected as some of them were incorrectly selected while I was configuring. 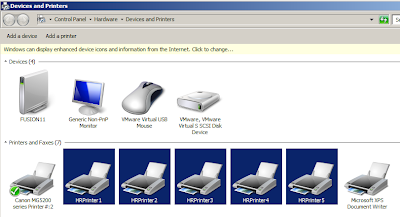 Once the configuration is complete make sure that the Configure Web Server is carried out. 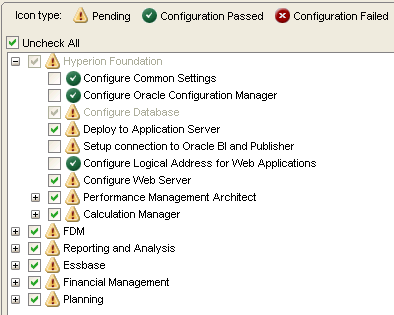 I noticed that in the Configurator even though EPMA had been successfully configured it still was enabled which I am sure is just a feature and will be fixed at a later stage. Once all the web applications have been successfully deployed if you select any of them again it should be possible to deploy them to a single managed server if required. The maintenance release doesn’t make a good job of cleaning the existing items from the start menu so you end up with additional menu items which are exactly the same as the previous ones. You will also notice that new versions of jdk and jrockit are being used and the previous ones are still there, if you have been through all the maintenance releases you will end up with three versions. Once the configuration is complete the clients could be installed with the standalone installers that are available which is straight forward so I am not going to cover it. 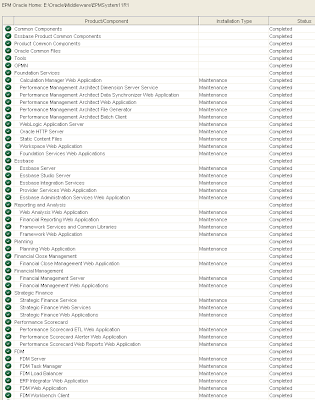 There are a number of post maintenance release configuration tasks to carry out depending on which products are installed, for full details have a read of the documentation but here is a summary. Clear the cache from all browsers this will ensure the latest files are being used. 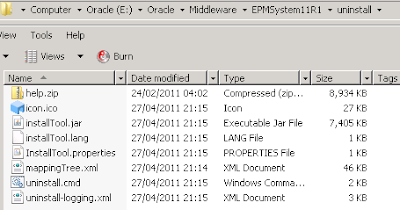 Essbase - If you have exported LROs these will need to be imported in using Maxl. 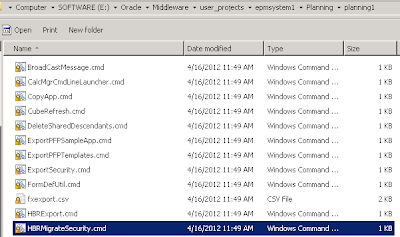 Essbase Studio – The catalog will need to be updated using the Studio command line client. Planning – Applications should be upgraded through the Upgrade Wizard. All the planning applications can be upgraded at once. A message will be displayed to let you know if the upgrade was successful or not and if the calculation mode has been changed from Business Rules to Calculation Manager. 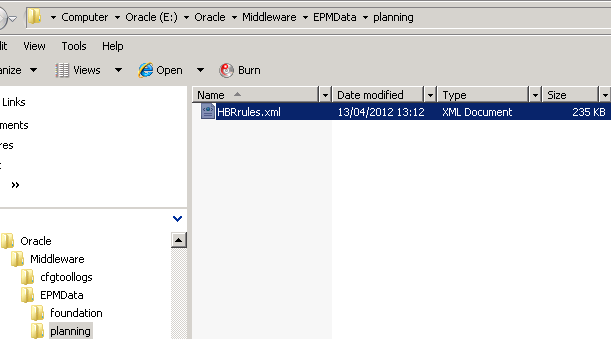 When the maintenance release for planning was configured it creates an export file of the rules. The format of the file is pretty much the same as if the rules were exported from EAS, if there are any issues with the migration to Calc Manager then it should be possible to edit the xml file. 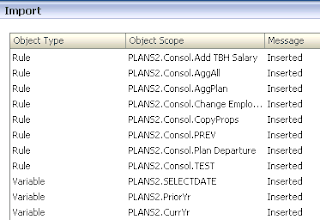 A table is also created in the planning system database called HSPSYS_HBR2CMGRMIGINFO. It looks like this table should hold the information of any rules that are migrated to Calc Manager though it didn’t seem to populate when I carried out a migration, I am not sure yet if it is used in a different way or is more for upgrades and not a maintenance release. To migrate to Calculation Manager. 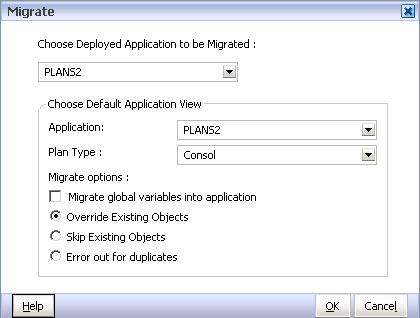 Select the application, plan type and the migrate options. A summary of the objects migrated will be displayed. The rules can then be deployed to the planning and the process should be repeated for each planning application. Make sure the rules have been converted to Calc Manager and deployed to Planning before using it. I think I will leave it there for today, I hope this has been useful, enjoy!! 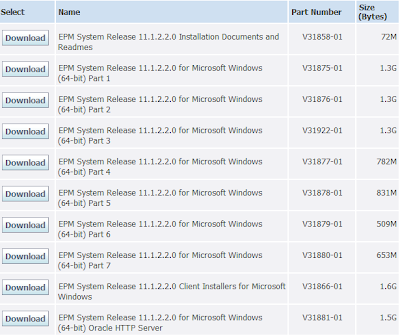 For the last four years I have written a blog about the installation of each release of EPM 11 and this year there is going to be no exception as 11.1.2.2 has recently been released. This release is more than just a bunch of fixes as it brings in new products, a multitude of product enhancements and changes to installation and configuration which I will be covering today. This blog is going to be around highlighting where there are changes from the previous release and not a detailed installation guide as there are a number of documents now available that help cover that area. I apologise if the blog contains any inaccuracies as a lot of it is new and I may have misunderstood a few details. First I think it is worth going through a number of the new features and changes that I have picked out of the documentation. 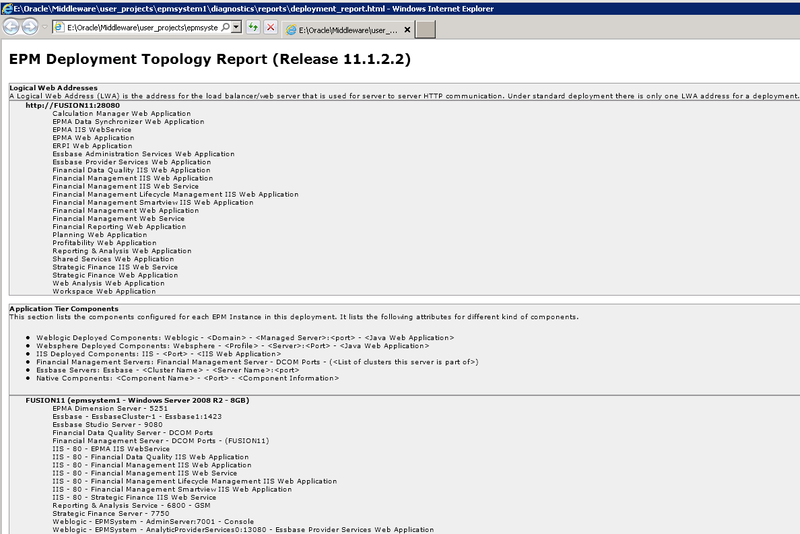 “IBM WebSphere 7.0.0.19+ is now supported as an application server.” – I know deployment to WebSphere has been on the cards for a while and it is now supported, the deployment is not through the EPM configurator and there is a script available to deploy the web apps, the full process to follow is available here. FireFox 10.x+ and Internet Explorer 9 are now supported Web browsers. – A big leap for the support of FireFox as 11.1.2.1 supported 3.5+, though still not supported for FDM. IE9 is not supported on XP SP3. Microsoft Office 2010 64 bit is now supported. “After completing an EPM System deployment, you can generate a deployment report that provides information about configured Web applications, Web servers, databases, and data directories used by EPM System. This report can help you troubleshoot issues that might arise in your deployment.” – I have already seen a presentation of this feature and I will provide an example after I have gone through the configuration. 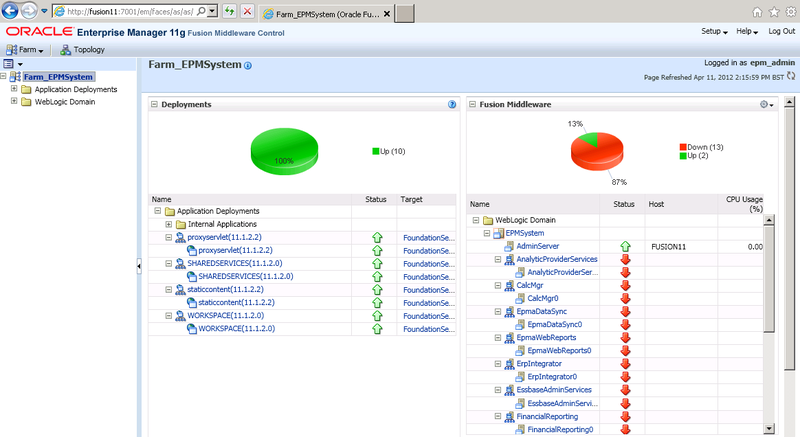 “The Oracle Enterprise Manager “Fusion Middleware Control” is now installed and deployed with EPM System. 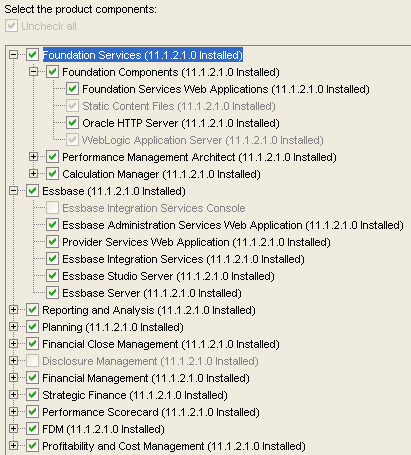 You can use this tool to manage the WebLogic domain and all Java Web applications in EPM System out of the box.” - This was available in previous releases by extending the WebLogic domain which I blogged about here and now you don’t even have to worry as it is all configured automatically. 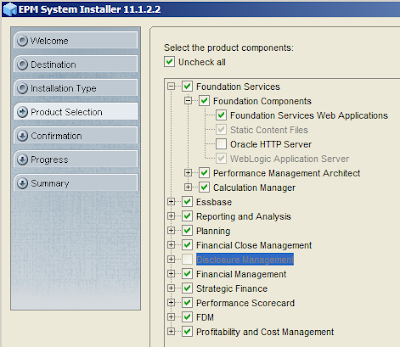 “The EPM System Media pack on Oracle Software Delivery Cloud has been simplified. Software downloads have been merged together.” – I will go through this shortly. 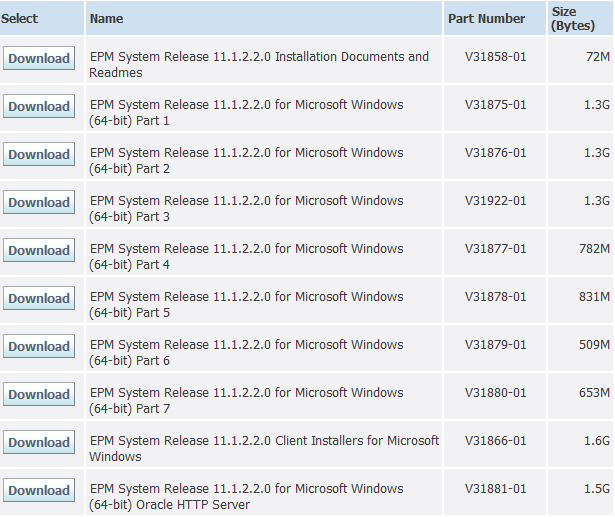 “Microsoft Windows Installer (MSI) Client Installers are now provided for Oracle Essbase Client, Oracle Essbase Administration Services Console, Oracle Essbase Studio Console, and Oracle Hyperion Financial Management Client.” – It was possible to get EAS and Studio installers in a 11.1.2.1 patch but it looks like all the clients are finally available as standalone installers. 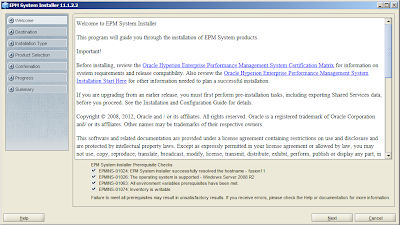 “Three new “rapid deployment” documents provide step-by-step instructions for building a typical Oracle Hyperion Planning, Financial Management, or Essbase development environment on a single server running Microsoft Windows.” – These documents were actually available in 11.1.2.1 but have now been updated for 11.1.2.2 and merged into the EPM documentation. 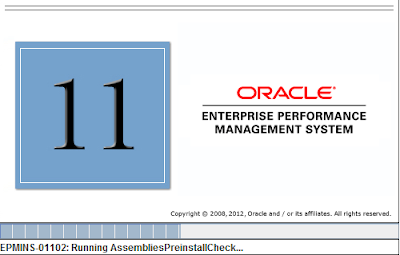 “A new Oracle Enterprise Performance Management System Standard Deployment Guide outlines the best-practice approach for deploying EPM System products. This approach is based on creating a base deployment of the products and then scaling out the services to handle the needed capacity.” – This was also available for 11.1.2.1 and has been brought up to date and merged into the standard documentation. Is there such thing as a standard deployment? A new “ADF” Web application has been added for Financial Management. – Is this the start of FM moving away from being forced down the windows IIS route, once again I think the new ADF interface has been optimised for IE9 and Firefox 10 but I believe you are not forced to use it and can use the existing one. 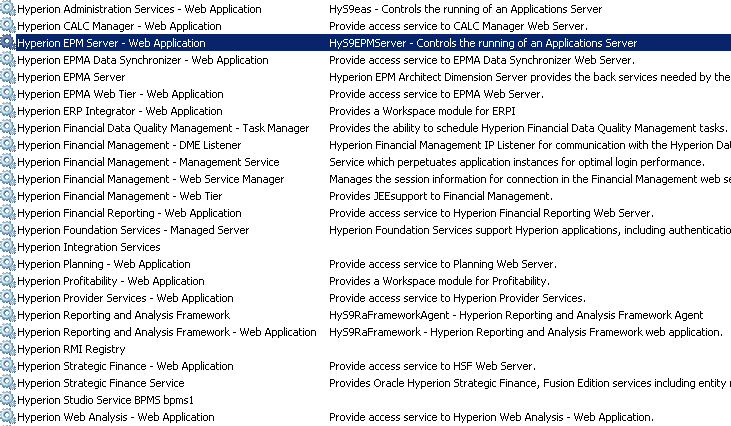 “The Oracle Hyperion Financial Reporting Print Server is now part of the Financial Reporting Web application. You no longer have to install the Print Server as part of the Financial Reporting Studio installation, and you no longer need Microsoft Office on the Print Server.” – All change again in this release but I believe it is a milestone as at last it looks like the print server is not windows only and there is no need to install a PDF renderer such as GhostScript. “You can now deploy EPM System Web applications to a single managed server (compact server) in Development, Test, and Production environments. This reduces the overall memory requirement of EPM System and reduces startup time.” – Compact deployment was available in 11.1.2.1 and I blogged about it here but it was only supported for development and was a manual configuration. I will cover this new feature in more detail in a future blog. There are additional important considerations if you are upgrading to 11.1.2.2 and using planning. “Oracle Hyperion Calculation Manager has replaced Oracle Hyperion Business Rules as the mechanism for designing and managing business rules, therefore, Business Rules is no longer released with EPM System Release 11.1.2.2” – Business Rules have finally bit the dust so if you are currently using them and planning to upgrade then it is worth investing time getting up to speed with Calc Manager. I will cover the migration in the near future. The documentation also states that the server hosting planning must have at least 16GB ram, I am interested to understand if this new release of planning really does require that amount of memory and how does that fit into the world of compact deployment. 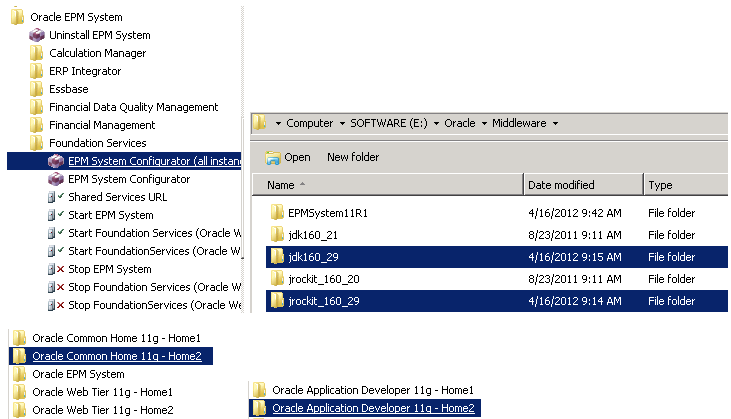 It looks like it still possible to use the existing 11.1.2.1 user interface by setting the property ORACLE_ADF_UI in planning to false. • Allows you to rename the default admin account during the deployment process. • After deploying Foundation Services, you can deactivate the default EPM System Administrator account after provisioning another user with the Shared Services Administrator role. I know the ability to change or rename the admin account has been raised a number of times in the past and it is good to see that Oracle have taken note. • New replace option for Reporting and Analysis where only artifacts that have a newer last modified timestamp will be imported. So you can see this release does bring in quite a few additions and changes and that is before even getting into the detail of all the product enhancements. 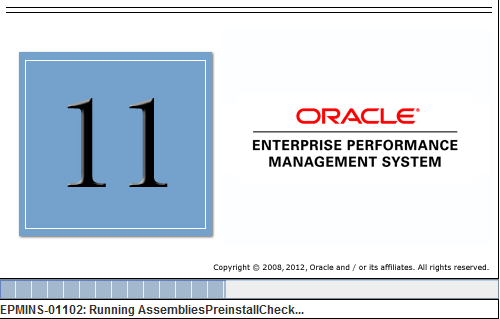 Anyway on to the installation and the first step is to download the assembles from edelivery, I am going to be installing on a single Windows 2008 R2 x64 machine using Oracle 11g as the repository. Straight away you will notice there is a change from the previous releases and many of the files have now been combined. 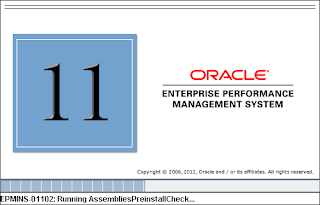 Parts 1-4 contain the common components and WebLogic, OPMN, Installer plus the core products, 5-7 contains the rest of the product assemblies. 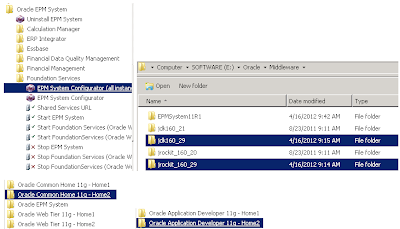 Oracle HTTP Server is a separate download. The standalone clients are available in one download. So hopefully this will cause less confusion like in the past with a prime example being the additional contents download. 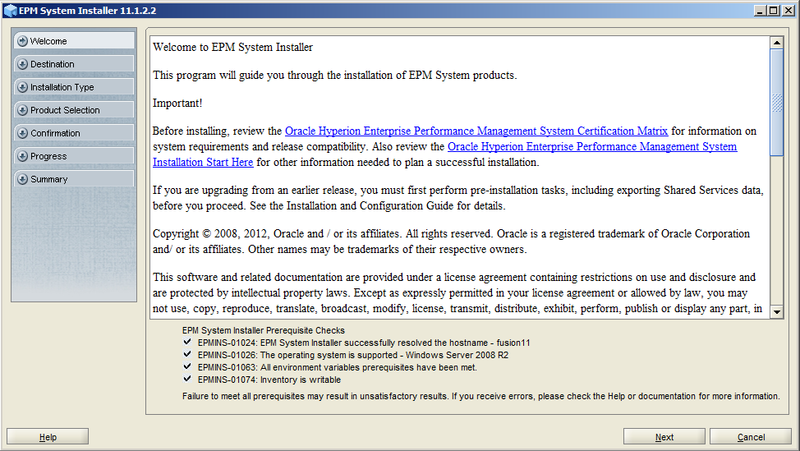 There are also additional product download available that sit outside of the EPM installer such as DRM, EAL, ODI. This will open a report that breaks down each of the license components such as “Essbase Plus” and provides a list of the files to download. If you expand the Part 6 download you can see that it contains all the essbase related product assemblies. When the installer starts up it will run through all the prerequisite checks, this screen is slightly different than in previous versions and you don’t have a command window running in the background which you used to have to check to see if any of the checks had failed for such things as UAC. If any of the checks failed these will now be displayed in an error panel window. Additional prerequisite checks will also be displayed indicating whether they have passed or failed, these checks look to be the same as previous 11.1.2 releases, though I don’t see the check against OHS anymore which is probably because it used to say that it had passed the check even if it hadn’t. 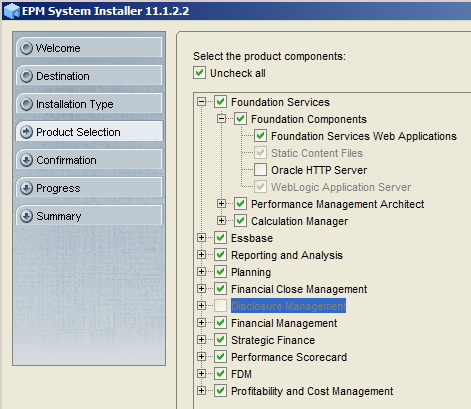 Select the location for EPM installation. As this is a new installation only one option is available. The option to install components by tier has now been removed probably because it was a bit of a waste of time as most of the time choose components individually was selected. Oracle HTTP Server is not checked by default as it is optional so if you intend of using it then it will need to be selected. Now that many of the installation files are combined then the likely hood is you are going to be given the option to be able to install lots more products than with previous versions. All the product components were installed successfully so it is on to the configuration. If you plan on using Web Services with products like APS, FM, PCM then make sure you follow the steps on creating the required schemas using the repository creation utility. 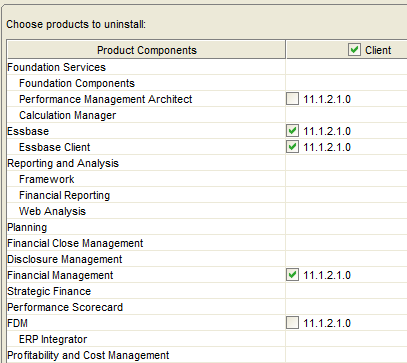 This screen has changed a little in previous versions there the options to create a new instance or modify an instance. 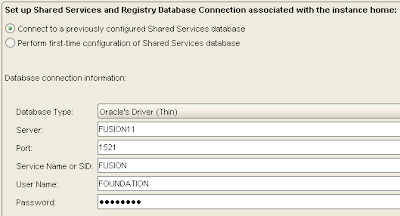 The first step like in previous version is to define the connection information to the Shared Services and Registry database. As previously the options are available to select to configure all the products at once or individually, if you are going to use a separate schema/database for each product then you will need to configure the products individually. Besides that the options are pretty much the same as previous 11.1.2 releases so I am not going to go through each of the products and the configuration as there is enough documentation out there to understand the process. 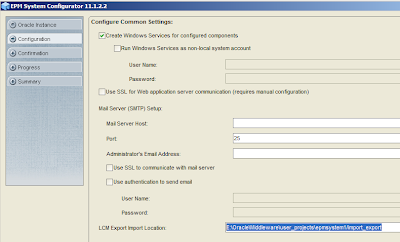 There is a new option to set the LCM Export Import Location which could be on a shared disk, previously the location was fixed unless changes were made to update the path in the Shared Services registry. 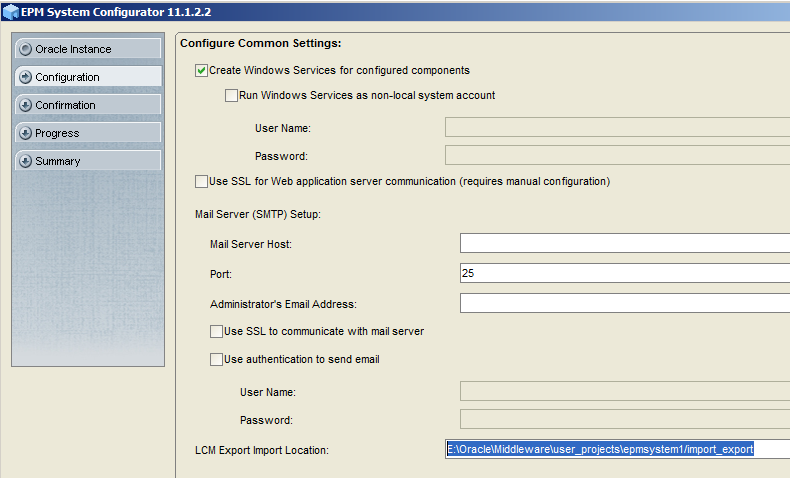 As this is the first configuration a new domain is created and the admin server port and admin user details set. 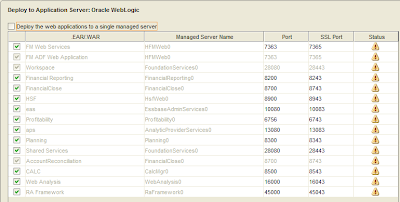 Please note this user is the admin user for WebLogic and nothing to do with Shared Services, in the past there have been a number of posts on the Oracle forums where there has been confusion between the two sets of admin users. 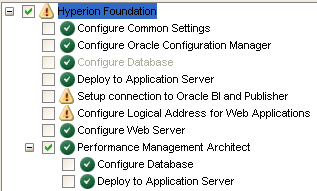 By default “Deploy the web application to a single managed server” is selected, this is known as compact mode which was available in the previous version. Compact mode is useful is you want to combine a number web applications under one managed server which would be sharing the same JVM and running on one port, this helps reduce the overall memory consumption and start up time though it is worth understanding that if the JVM crashes for any reason then you take out all the products running under that managed server. 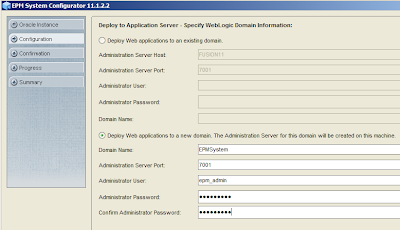 If you deselect the option then the web applications will each be deployed to their own managed server and port. It also looks possible to have a number of web applications to run under one managed server and then have the rest deployed to their own managed server. I am deploying each of the web applications to their own managed server and will be covering compact deployment and scaling out in a future blog. If you are deploying FM then you will notice that there is the new ADF web application that is deployed to the same managed server as the Web Services. 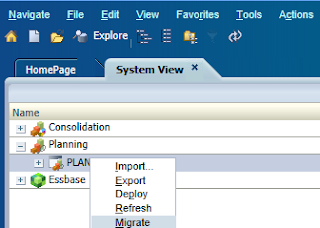 If you are combining all the products into one database then you have the option to use the Shared Services database or configured them to a new schema/database. If you are configuring a database/schema per product then you would choose first-time configure of database. Here is another change which I outlined earlier in that you can define the admin account name to be used instead of it being fixed to admin, I am going to be daring and test out the new functionality so I changed it to EPMADMIN. Once all the products have been configured then like previously the Configure Web Server should be run. 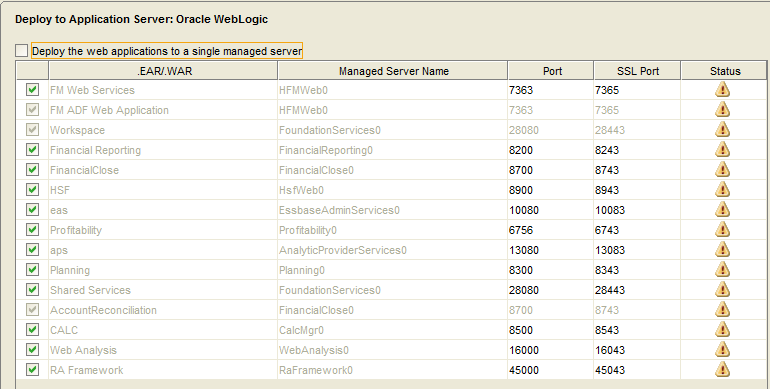 If you select the embedded WebLogic HTTP server you will see that it is deployed to the foundation port 28080. I am assuming this means you can access workspace and all the web applications through that port which I am sure has the possibility to cause no end of confusion. There have not been many changes to the windows services created. 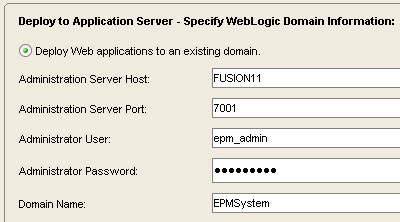 If you deployed any of the web applications to a single managed server a new windows service will be created called "Hyperion EPM Server - Web Application"
If you start up the WebLogic admin server and go to http://adminservername:7001/em then you should be able to log into Enterprise Manager with no additional configuration required. I think I am going to leave it there for today as I need to test out all the products, I will update if I find any serious issues. Next time I will be testing out applying the maintenance release to an existing 11.1.2.1 environment.